I am a huge Jackie Chan fan. From 1995, when Rumble in the Bronx hit the screens, I have always put a Jackie Chan film at the top of my must see list. It surprises me to realize that I have never seen Project A before. I thought I had seen, but when I put the blu-ray into my player, I found the film to be foreign (no pun intended) to me. I had seen some of the big set pieces from the film, but never the whole thing. I guess I can blame that on the fact that Miramax and Dimension Films own it, which means that the film is cut here in the states. I don’t like watching cut down versions of films, therefore I didn’t watch it. It was my loss though because I found Project A to be a great experience. The plot of the film is not really all that great, but Jackie Chan couldn’t care less about plot. He is a situational writer and director. The plot is the skeleton, a very thin skeleton, on which Chan hangs his mastery of fight choreography and direction. I know that you are looking at the last sentence and saying to yourself “How is Chan a master at directing?”. Am I right? I know I am because I asked that same question when I started watching Jackie Chan films. Tony Zhou, who is a YouTuber whose channel Every Frame a Painting, has a video that I think anyone who is a Jackie Chan fan or loves film, should watch. In it he talks about how Chan frames his fights in a way that the audience never gets lost, and provides some foreshadowing, and edits his fights for the reaction, not the hit. American directors edit on the hit, so we never see the impact, it is only implied. Chan lets the cut be dictated by what is happening. He shows the whole thing, which means that we get to react to everything in a far more enjoyable way than we do with most American films. Chan also likes to build his scenes into a crescendo that usually means that he is about to get hurt. In Project A there is a big chase that is the center of the film. The chase starts slowly with Chan trying to get him and his girlfriend away from the bad guys. Chan runs and mugs for the camera and is eventually caught by the police, who are also looking for him. When he gets away from the police, he realizes that the bad guys are still there, so he climbs a flagpole and thinks that he is safe. Another bad guy shows up at the top of a clock tower (where the flagpole lead to) and there is a fight scene. After beating the bad guy in the clock tower, Chan thinks that he is safe by climbing onto the outside of the clock tower, but he isn’t. This leads to a very famous scene where Chan falls from the clock tower, which is three stories high, into a few awnings before hitting the ground. The above scene shows everything that Chan is good at. The scene is exciting. We have no idea how the scene will end. The scene has some laughs. While doing some tricks on a bicycle while running away from the bad guys, the seat on the bike is set loose and Chan sits down on the pole. A crude joke, yes, but it is still pretty funny. Chan isn’t the only star of Project A. He also gives Sammo Hung and Yuen Biao big roles. Hung plays a thief and a friend of Chan’s character. Hung is a gifted performer and has some of the best lines in the film. Yuen Biao is Chan’s boss and is the straight man of the film. Biao gets to shine in a scene or two, but has had bigger roles before and after Project A. This is the first film where the Three Brothers (known as such because they grew up together in the Peking Opera) and they have a lot of fun in the roles. They do even more in Wheels on Meals and Dragons Forever. I am glad that I watched Project A. The film is shot well, the staging of the scenes and the cinematography are all top notch. There are some big scenes in the film and Chan captures each scene beautifully. The film moves at a brisk pace too. The run time is one hour and forty-five minutes, but it flies by. There is a lot of action on display here and Chan moves from one action scene to another with a quickness. The comedy is well played as well. Chan is a huge fan of silent films and there is a lot of Buster Keaton all over this film. 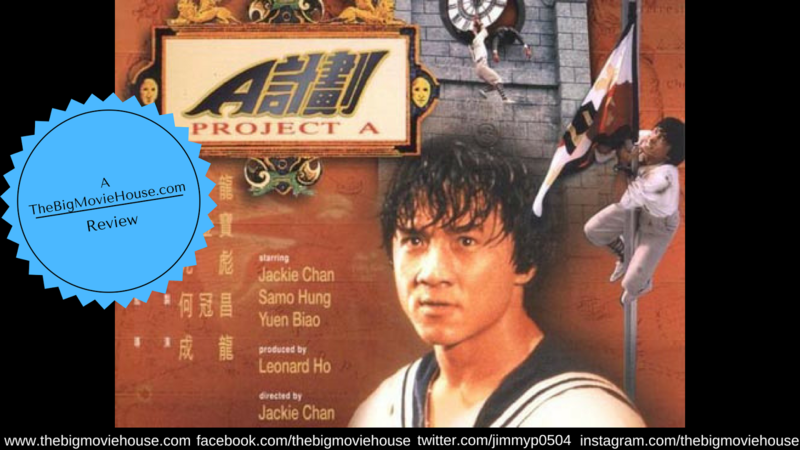 Project A now enters the list of Chan’s best films. I just have to figure out where to put it.